Create a dynamic digital workplace with the flexibility and security of IBM Cloud. Access features anywhere, via desktop and mobile devices. Build apps to access files, contacts, and collaborate through Communities, Blogs and Wikis, while securing your intellectual property and data in the IBM Cloud. 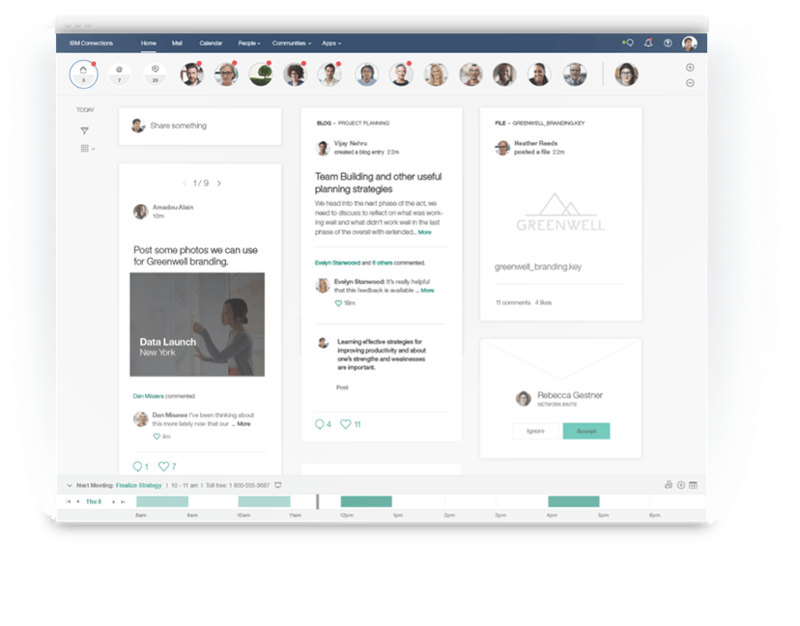 Fully engage your teams and partners with the right content at the right time. 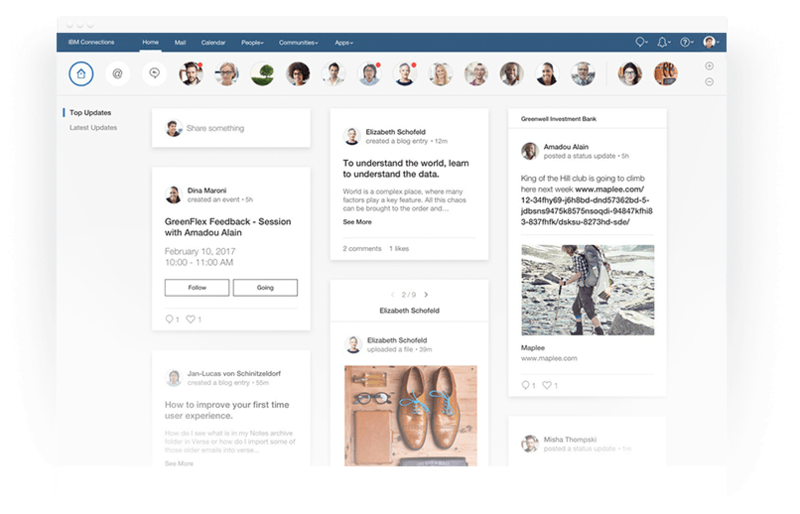 Offer employees one personalized place to access their productivity tools and get tailored organizational updates. Control levels of access to all files, for internal and external users—even in the cloud. We help with migration, data transfer, and maintenance, and privacy features ensure effective compliance. Today, digital disruption is affecting industries of every kind, all over the world. In fact, 69% of all businesses lack the flexibility and agility to successfully undergo a digital transformation—and the resulting unproductive meetings, interruptions, and knowledge silos are costing the U.S. economy over $588 billion every year. Find out how IBM Connections offers an antidote to this reality, with a comprehensive suite of tools and technologies that support employee engagement and productivity. Unnecessary meetings are a waste of time and money—up to $2.1 billion are wasted at Fortune 500 companies every year. Add to this, disjointed workflows, distractions and interruptions cost the US economy almost $600 billion. The companies that are innovative and the leaders of the future are trying to digitize their ecosystems, transform their workflows to be digital first, and replace their enterprise software technology. 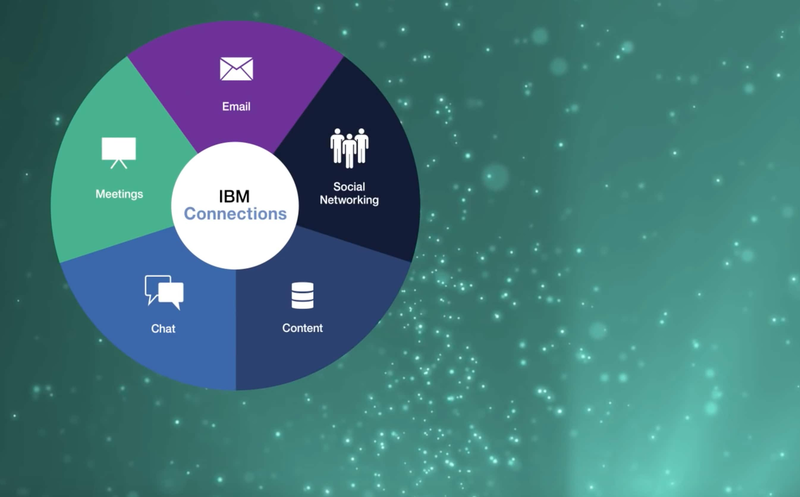 See concrete examples of how IBM Connections can help organizations enable collaboration, streamline workflows and achieve complete enterprise transformation. How do you measure the ROI of a collaboration solution? A step-by-step guide to getting most out of IBM Connections for your organization and teams. Learn how to increase adoption, use, and return on investment by engaging internal champions and sponsors to leverage the network effect. IBM Connections helps organizations dramatically increase end user productivity through knowledge sharing, decision-making, and innovation, along with reduced IT operating costs and complexity, by consolidating disparate systems onto one platform. 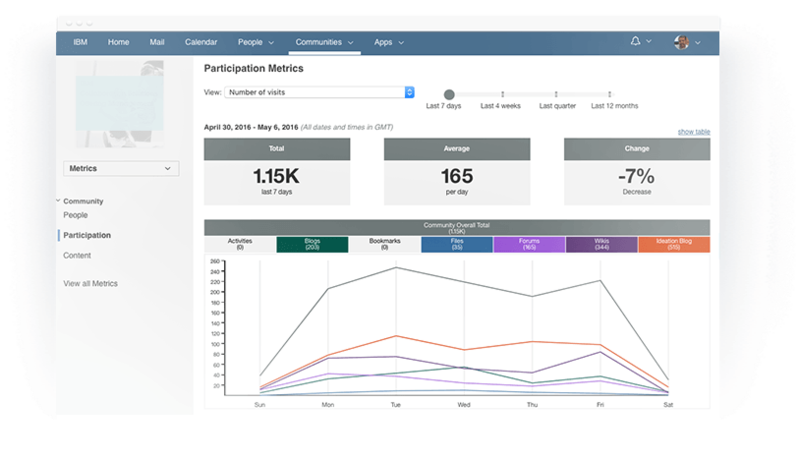 See how IBM Connections customers are using different features to boost productivity and drive employee engagement. 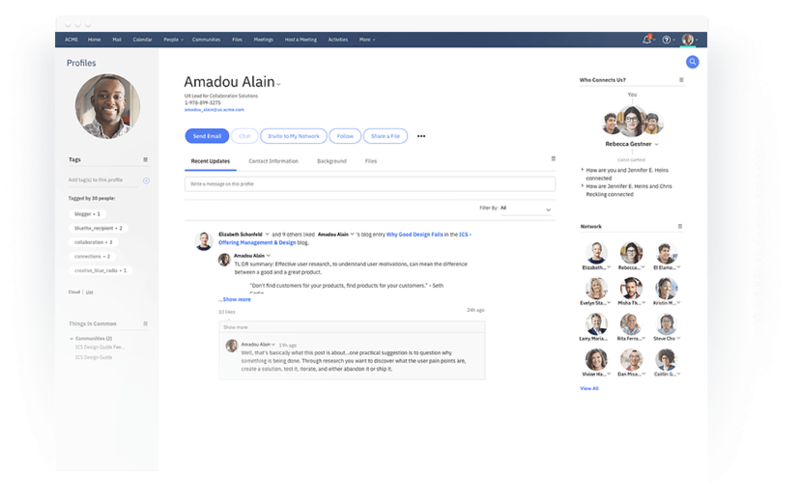 Capabilities such as communities, rich profiles, meetings, chat, collaborative document editing, file sharing, and much more, support your entire collaboration environment to help people engage with networks of experts and harness the power of collective intelligence. In addition, IBM Connections provides native mobile applications that support a broad range of mobile devices and operating platforms, giving users access to the trusted expertise of their professional networks and communities virtually anywhere, anytime.